Scott Milne talks with his father, Donald Milne, as election results are reported. In a remarkable turn of events, Democratic Gov. Peter Shumlin and Republican challenger Scott Milne called it a night Tuesday without either candidate declaring victory or defeat. At midnight, with 80 percent of precincts reporting to the secretary of state’s office, Shumin led Milne just 81,485 votes to 79,057 — or 46.5 percent to 45 percent. Libertarian Dan Feliciano trailed with 7,630 votes, or 4.4 percent. Shumlin appeared in the Adirondack Ballroom at Burlington’s Hilton Hotel at 11:15 p.m. to tell supporters they would have to wait until Wednesday to know for sure who won. 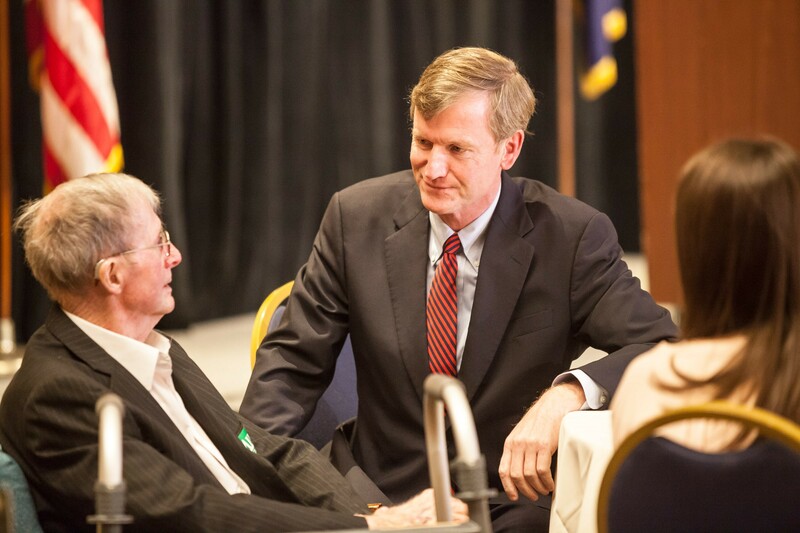 Twenty minutes earlier, Milne told Republicans gathered at Burlington’s Sheraton Hotel that his message, “to slow down a little bit on being the most radical progressive state in the country every day,” had resonated with Vermonters. He acknowledged that “it looks likely that we might end up on the short side here tonight,” but he did not concede the race. Whatever the final result, the race is now in the hands of the legislature — since neither candidate could plausibly reach 50 percent of the vote. The closeness of the race surprised most political observers. Just two years ago, Shumlin handily defeated Republican Randy Brock 58 to 38 percent. But Shumlin has struggled recently with the state’s troubled health insurance exchange, rising property taxes and questions about his single-payer health care reform agenda. A Castleton Polling Institute survey completed in early October showed just 45 percent of the electorate approved of his job performance, while 41 percent disapproved. A few factors worked to his advantage: Republicans struggled to recruit a strong candidate to run against him, while Progressives chose to sit out the race. Shumlin had a hefty campaign war chest at his disposal and, as an incumbent, was able to keep in the public eye while hoarding those resources for the final sprint. Most importantly, Shumlin benefited from a split in the opposition between Republican nominee Scott Milne and Libertarian Dan Feliciano — and from both candidates’ inability to catch fire. That split may have saved his political career. Milne, a Pomfret businessman and political novice, filed his candidacy at the very last minute and took his time getting his campaign off the ground. After Milne introduced himself as a moderate who was willing to consider single-payer, conservative Republicans rallied behind Feliciano, a management consultant from Essex. Feliciano failed to overtake Milne as a write-in candidate in the GOP primary, but he continued to hit the Republican throughout the general election. Shumlin spent much of the campaign trumpeting his support for renewable energy jobs, mandatory labeling of food containing genetically modified ingredients and increasing access to education. 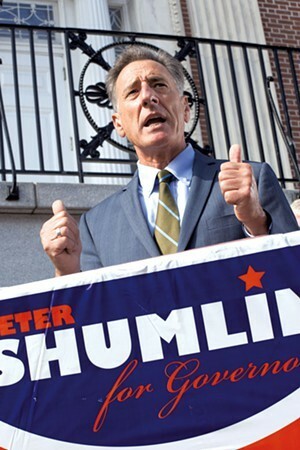 Milne mostly focused on criticizing Shumlin’s health care agenda as “radical” and “reckless” and questioning how much time the governor spent out of state. Feliciano pledged to stop single-payer in its tracks, lower taxes and expand school choice. Also running were Liberty Union candidate Peter Diamondstone of Putney and independents Emily Peyton of Putney, Cris Ericson of Chester and Bernard Peters of Irasburg. The Emperor’s New Bros: Can Shumlin Sell Single-Payer to Legislators?